The Department of Defense has begun the development of low-yield submarine-launched nuclear cruise missiles, USNI News reported Wednesday. John Rood, undersecretary of policy at the Department of Defense, said the U.S. military also requested funding through fiscal year 2020 to perform low-yield alteration to existing ballistic missiles and warheads deployed on submarines. The U.S. Air Force is selecting sources for an upcoming contractual effort to rebuild wings of the A-10 support aircraft, Military.com reported Tuesday. Ann Stefanek, an Air Force spokeswoman, said the branch is allotting $267 milllion to purchase 20 wings through the A-10-Thunderbolt II Advanced-Wing Continuation Kit program's next contract. Patrick Shanahan, acting secretary of defense and 2019 Wash100 Award winner, said the government will name nominees for the U.S. Space Force leadership post in the coming weeks, Defense News reported Thursday. 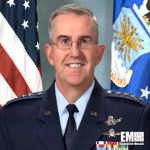 Pentagon officials propose the new service branch operate directly under the leadership of a senate-confirmed, space-focused U.S. Air Force undersecretary.